In what way are the past lives of letters there in each iTteration of the letter, each allograph? How is sound, movement or meaning written in/by our bodies, by our yinscriptions, our yanguage? The infinight in our unfinishedness? A metaphor is a kind of close reading. A noticing. One of these things is (not like) the other. Is reading always about a connection between two things? A sign and a sound. A shape and a thing? A gesture and the gestarticulated? Jest kidding. A reader and the read. Thered be the red thered even if you didn’t red it. Sigh here on the dotted line: reading my name with a sign. Nelson’s is a dance of signs. Of designs. 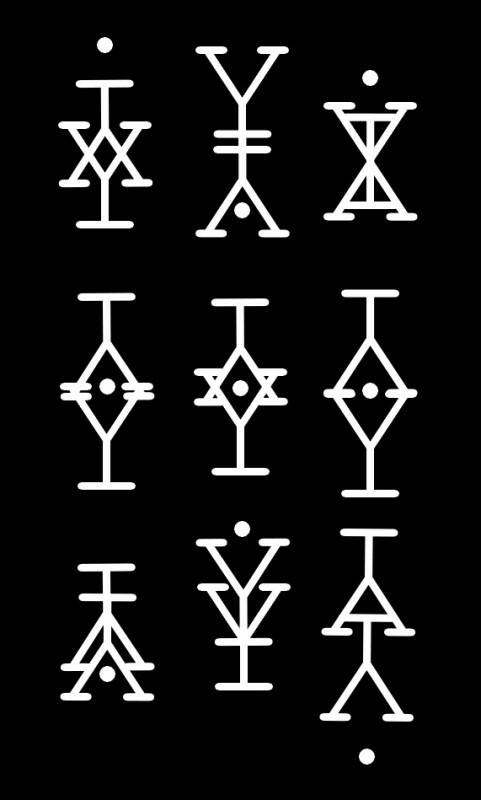 Sigils. Signs within signs. A metaphysical Kama Sutra of letters. Two close together become else. Letters began as metaphors. An A is an inverted ox-head. Y is three ways of looking at a blackbird, all converging in a single point. And Y in Stephen Nelson’s Dance is the lifting of hands. One Y lifts another. An ideogram. Can we read each letter as a metaphor? An ideogram is a graphic symbol that represents a concept or an idea. Must it represent a completed thought? Can it be a poetic gesture? A feinting toward image or idea? Must it always be a metaphor? Lettaphor? Alphabetaphor? Or perhaps: metavore. A signifier which consumes its own signification even while it leaves signs of its own insignification. This grid of letterforms. Writing as symbol. Nondirectional. Perhaps from an unknown/unknowable writing system. An ancient or future writing. Or how we imagine it. What might appear on a scroll. A door post. A priestly robe. A computer screen. Yhite Courier typewriter font on black. Made defamiliar because inverse. The night sky and constellations. The page made infinite. Metaphysical. Nongravitational. The page is the body. And it isn't there. Everything symmetrical is magic because it is itself while not itself. Like a past life. And what about the inverse? Could we conceive of an imaginary sound, or an imaginary energy shift from a novel letter shape or a yolking together of two letters? Could we conceive of imaginary meaning? Meaning-and-a-half (sequisemantics)? What is the sound of an imaginary letter? What is the weight of half a thought, an irrational meaning? And are there visual poetry dialects: the local mouth, the regional eye? The bumpersticker on my abecedeLorean car: Write globally, sound locally. Also: are there alphabets like numbers: imaginary, irrational, fractional and with decimals? The letters between. What about an alphabetic hadron collider? A graphemeutrino? Can we determine the shape of reading? Its 'wait'? The eyes and ears are portals. The brain picks up the signal and the mind processes, but something deeper is touched. If the image or the sound reach far enough, they stimulate something more essential. You might call it the spirit screen, or a blank white sheet of consciousness. You might say it emerges from a source which in itself is pure sound, pure love, though infinite and formless. And so sound meets sound and image meets...formlessness. The Creator receives through our eyes and ears. I like working visually with letters, noticing how the tiniest detail of the smallest unit of language stirs the mind or the heart. Tiny details are precious, but powerful. One letter relates to the shape of another as we relate to each other, or ourselves, or our own experience of reality. Every gesture speaks, a hand holds a hand, an arm embraces a shoulder, a ‘Y’ lifts another ‘Y’ and spins it joyously around. Everything connects. It all registers somewhere deep within and has the power to shape us or shift us. The eye wants to flicker, glint, twinkle; the heart wants to spark. I also like balanced, symmetrical or flowing composition because it speaks to the internal need for balance, wholeness, and the flow of energy which pours from nowhere and returns to a nowhere which is everywhere. Clutter sends me into panic, so I create clean poems, poems that are small and still, but not rigid, poems that reflect the flow of life around a still point which in itself is a reflection of a point of infinite stillness and singing. But life is a riot and words are messy when spoken in a riot of living. The words around me are hard, metallic, clanging, muscular, but delivered in mellifluous tones and heartrending rhythms. It doesn’t seem at all difficult blending the cosmic and the quotidian, because it’s all life and the mind and the body are equipped for life because they are constantly being held. “There is no moment that is not held,” said one of the Scottish poets*. And we hold our impulses and emotions in words that reflect who we are, where we have come from, what it is that holds us: family, community, history. The Scottish dialect is a sound poem that’s as tough and resilient as a Glasgow street. It’s also concrete. It has shape and the ability to connect or uproot us physically. We are hammered into some sort of shape by words, like ships or sheets of steel. We stay anchored, or we drift off. Scotland has a history of great concrete poetry and great dialect poetry because each expresses a physicality, an energy that radiates from the land and the people. I’m particularly concerned with how that energy shapes the Self. I’m interested in connecting with environment through sound and shape and movement. I’m interested in the body (or the tiniest visual poem or the roughest, homespun phrase) as a finite house of the infinite. Stephen Nelson is a Scottish poet and musician who lives in Hamilton, Scotland. His blog afterlights features many of his visual poems as well as other writing.